This story is dedicated to the 453 Belconnen Kangaroos Killed by the A.C.T. 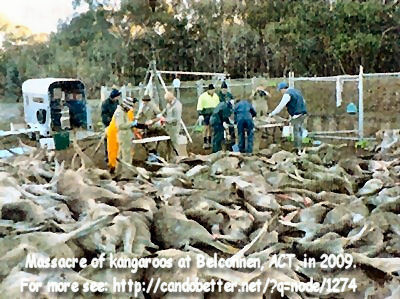 Government in a Kangaroo Management Cull, 2009. For the neglect and greed of man. The balance of the land. You have given us, all because of lies. The Kangaroo Industry and the Australian Government’s aim is to brainwash the public into believing that if Kangaroo numbers were not managed they would be out of control. My account of observations and experiences with Kangaroos over the last twenty five years , I believe, proves otherwise. I have come to this conclusion without the need of tracking collars or a film crew, just time, patience, passion and an undying love for Kangaroos. My discovery of animal love and compassion spans from Gooby to Kobei, with a variety of animals along the way. Fifty years of experiences, some incredibly beautiful, others terribly traumatic. My first realisation that animals experienced feelings occurred at the age of three in the backyard while peddling around the cement pathways of the cottage garden on my bike. Gooby was my first cat, a long haired Tabby, I adored him. Gooby’s tail was laying across the path blocking my racing circuit and I can vividly remember questioning myself about what his reaction would be if I casually ran over it. I stopped peddling and seriously contemplated doing the deed but decided, with the help of a piercing stare from my Mum watching me through the kitchen window and a deep affection for Gooby, it was not such a good idea. I dismounted my bike and carefully picked up Gooby who greeted me with his soft purr and gentle smooch and decided it was time to have an afternoon sleep with my beautiful Cat. It was at that very moment I awakened to the fact that animals have feelings and emotions. I have in the fifty years since that day experienced many beautiful moments which are also etched into my heart and have added to convince me that animals have an incredible capacity to love and care for, not only their own species, but also Humans. I have been a Wildlife carer specialising in Kangaroos for almost half my life and have lived with Kangaroos twenty four hours a day, seven days a week for all that time. I came to live in the Adelaide Hills in 1983, an area which is fortunate to still have pockets of bush where beautiful Western Greys are native. Unfortunately, habitat loss and the usual suspects which threaten Kangaroos including barbed wire fencing, increased human population vehicles and dogs, there are going to be Kangaroo casualties. I decided to convert my property into a safe haven for Wildlife and become a carer for injured and orphaned Kangaroos and Joeys. 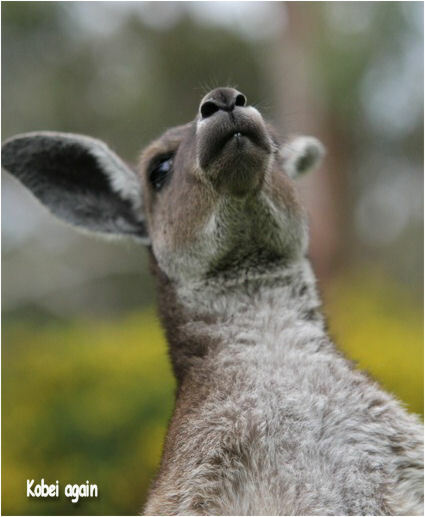 My new life with Kangaroos began after being invited by my sister to attend an Open Day at an R.S.P.C.A. shelter. As I wandered around checking out the various animal related stalls I came across a group of Wildlife Carers sitting with Joey Kangaroos who were snugly tucked away in hanging hand made pouches. After a brief chat I was encouraged to put my name down to perhaps adopt an orphaned Joey. 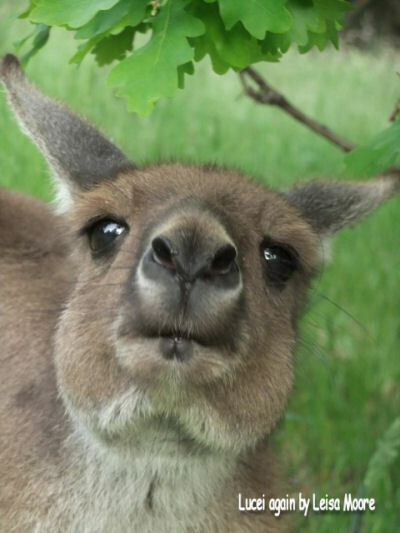 I guess the organisation involved in rescuing the Joeys felt that I would be a suitable candidate as I had a small property in the Adelaide Hills where Kangaroos could be cared for in relative safety. In South Australia Kangaroos are not allowed to be released into the wild if they have been hand reared. A year after the Open Day, out of the blue, I received a phone call from the Kangaroo Network asking if I would like to take on an orphaned Joey. The Joey was a Red Kangaroo male from Port Augusta, orphaned after his Mother was shot. I hesitantly said,‘yes’ and named him Androo. Soon after acquiring Androo I received another call and was advised to take on another joey to keep Androo company, another Red Kangaroo Joey, a female this time, I named her Roobei. Roobei was orphaned after her Mother was involved in a collision with a vehicle. Androo and Roobei came to school with me, I was employed as an Art/Design teacher at an elite boys college in Adelaide. Each morning before my trip to work I would bundle up the Joeys along with the pouches and milk formula required for the day. Joeys at a very young age require special milk replacement formula four times a day, need to be kept calm, they also require warmth and minimal handling. Only a few carefully screened boys ever got to see the Joeys, boys whom I trusted would not stress them in any way. When I first started the teaching position at the College I vividly remember overhearing horror animal stories the boys had with each other as they went about their work. There was a great deal of cruelty in their conservations. By the end of my eighteen years teaching there, the attitude of the boys in regards to animal welfare completely changed and each and every day I was pleased to hear something pleasant about animals or being greeted by a boy with a creature of some sort with an injury which I was expected to help in some way. Androo and Roobei had to remain a secret until I felt it safe to reveal the secret in the Art room to the Principal.That meant hoping that the three hundred and forty Preparatory school boys I asked to keep the secret did just that. Luckily, the Principal accepted the fact that two Joeys would be attending the school for a short time and all was well. I was able to keep the Joeys safe in the dark room and allow them access to the whole Art room at recess and lunch. 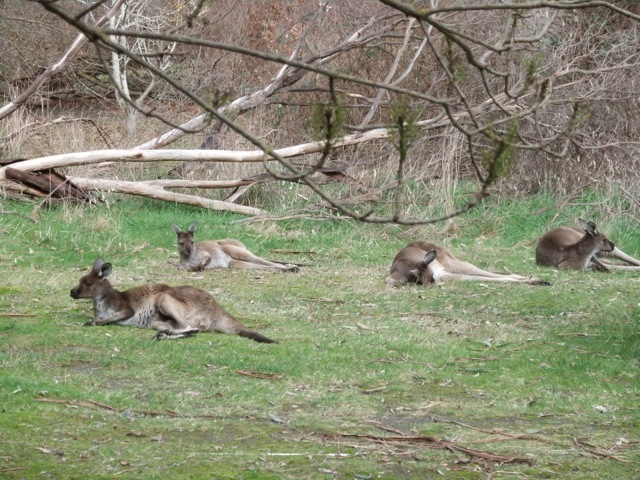 A few months passed and the Joeys were coping excellently and becoming more active and interested in their surroundings. It was nearly Christmas and I was looking forward to the Christmas holidays which would be the time to prepare them for their new lifestyle. At the end of the Christmas holidays Androo and Roobei would not be returning to school, they were getting too big and too active, they would remain at home. I could hardly wait to return home to be with them the first day back after the Christmas break. The anxiety experienced being from being away from the Joeys was too much to bear. My only option was to risk the financial security of being employed full time and apply to go part time so I could spend more time helping Wildlife. I was granted a reduction in contact time giving me the opportunity to became more involved in Wildlife issues and was offered the position of S.A. Representative for the Australian Wildlife Protection Council. I still hold that position and do all I possibly can to help the beautiful Kangaroo. A few years on, half way through one of the Art lessons a student approached me with some alarming information. He informed me that his family had a Joey in a box in the garage at home. After some intense interrogation, the horrible story was revealed. 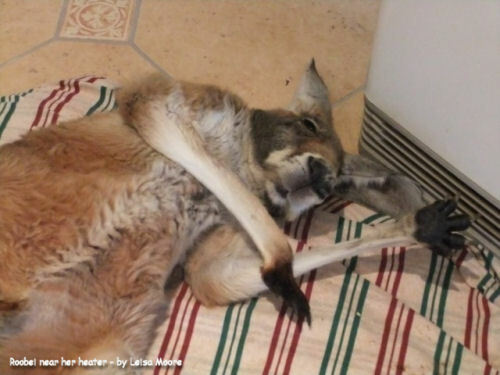 The boy’s Father and Grand Father had been shooting Kangaroos on their country property on the weekend and one of the Does shot had a Joey in her pouch. 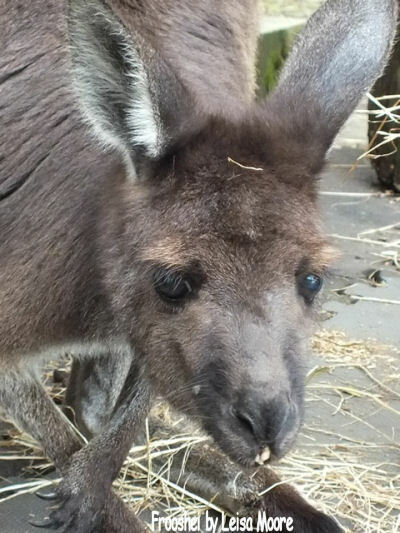 Apparently the boy pleaded to his father that they take the Joey home to keep. The petrified Joey had been kept in a cardboard box for forty eight hours without fluids. I insisted he contact his Mother and to bring the Joey into me. Permits are required to keep or hand raise Wildlife and these people had no permit and no idea what they were doing. It was not long before a beautiful little Western Grey arrived in a cardboard box, scared and dehydrated, a female with barely any fur, just a velvet haze over her body, weighing 600 grams, I named her Frooshei. Her pale blue undeveloped pupils stared up at me, I instantly fell in love with her as I did with Androo and Roobei.They were my life and I wanted the best life I could give them. Veterinary help was almost non existant back then so it was really hard getting help in that regard. I had been reading and researching anything I could possibly get my hands on about Kangaroo diseases and medications, diet and Kangaroo husbandry. Frooshei is going to turn fifteen this year and has developed into a fiesty girl who believes it is her job to boss around the younger Joeys she shares her life with. It was on one of my days off a terrible accident occured. I was on my way to get some milk formula when all of a sudden, as I was negotiating a sweeping curve, I saw a vehicle speeding towards me on the wrong side of the road. I remember experiencing about two seconds before the head on collision happened and the last thoughts I had were, “This is going to hurt,” and “I need to survive this for the Kangaroos.” Obviously, I survived the collision. I was, however, severely injured. Apparently, the driver and occupant of the other vehicle forgot to return to the left hand side of the road after road works, they were from somewhere overseas where driving on the right hand side was normal. My injuries were so bad that I was unable to continue working after trying to continue for a year following the accident. I had to resign from my teaching position which had been a part of my life for eighteen years. Since resigning I have completely dedicated my life to Kangaroo welfare, rescuing and caring for Kangaroos and voicing my concerns about the Kangaroo Industry and Government Kangaroo Management Plans and Culls. I have vowed that I will do all I possibly can for Kangaroos and this passion grows daily. I believe my love for Kangaroos is the sole reason I have pushed through the hell of diagnosed depression due to chronic pain. I now spend every single moment with what I love, a special love only a few people ever experience.... Kangaroo love. 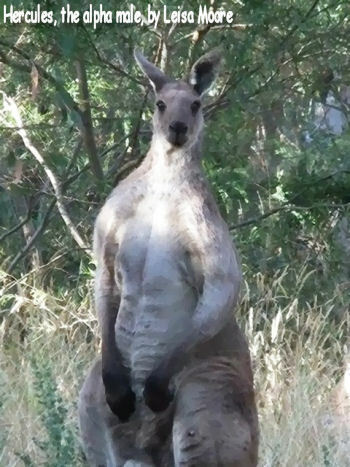 I live in an area which is home to the Western Grey kangaroo. Even though they are not threatened by the Kangaroo Industry the Kangaroos do experience their fair share of challenges in their strive to survive. I have been observing, documenting and photographing a Mob of Kangaroos who live close to my property for approximately 25 years, during which time I have been fortunate to observe some very intimate, numerous funny, and many beautiful moments.The Mob has had to adjust to an influx of humans due to the increased popularity of the ‘Tree Change’. This particular Mob of Kangaroos have not been subjected to ‘Culls’, they have been left to manage themselves and have proven to be expert at it. In monitoring the Kangaroos I have not needed to utilise collars fitted with transmitter devices or employ a film crew, just love and a passion for the Kangaroo was required. The Mob has never exceeded fifteen in number and the area they roam is roughly four square kilometres. The alpha male, named ‘Hercules’ is transient and prefers to live a solitary existance except when females are in season. Hercules will then visit the females (Does) and stay around them whilst they remain in season to keep other males (Bucks) from mating them. Hercules will not always choose to mate each female, he decides whether or not to do so. The Doe will not usually allow herself to be impregnated by other Bucks so it can be a frantic time with Does racing all over the place in their attempts to escape unrelenting Bucks. This is where Mob dynamics are destroyed by the likes of the Kangaroo Industry and Government controlled Culls. The shooters who shoot for the Kangaroo Industry aim to kill the large Bucks as they get paid per kilogram for the carcass. Also, companies like Adidas insist on the large skins for their ‘Predator’ Football boots. In doing this, the Mob is no longer protected as the Alpha male is taken and the Does are chased down by the Juvenile Bucks resulting in a weakening the gene pool . 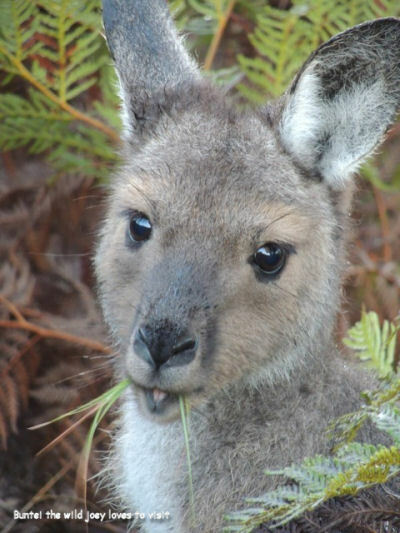 Due to predation, one out of three Joeys will not survive past twelve months of age and only one on average will grow to adulthood. Vehicle collisions, dog attacks, fences, human intervention and who knows what horror is inflicted on them when they venture onto private property, all contribute to their demise at a young age or any age in all seriousness. Living life as a wildlfe carer combined with being fortunate to live amongst wild Kangaroos is a gift. I have been priviledged to have experienced an incredible insight into Kangaroo behaviour and dynamics of the Mob and have been welcomed into their world. Words cannot express what I would like to do to the person who invented Barbed Wire. The injuries and deaths that happen to Wildlife because of the wretched stuff is horrific! I can clearly remember being called out to a property where a Joey, I named ‘Bailei’, was seen caught in a fence with it’s hind legs twisted in the Barbed Wire. As I approached the the property I dreaded what I would be confronted with. The person who contacted me was waiting and took me over to where the Joey was hanging. A possible scenario could be, the Mob the Joey belonged to was frightened by a vehicle or a dog. In the Bailei’s endeavour to keep up with his Mob he was unable to clear the fence and his legs got trapped between the two top strands of the Barbed Wire. Bailei must have been hanging and struggling for quite some time as the blood was dry and the damaged area was not fresh, the Joey had nearly ring barked both his ankles. All the fur and flesh had been ripped off in his panic to free himself from the fence, the Tendon and bone on one ankle was exposed. I covered his head and carefully cut him from the wire. Bailei was extremely brave and as soon as he was free he snuggled into my arms and fell asleep. He trusted that I was there to help him and never at any stage of caring for him did Bailei show fear. It took several months and a great deal of medication and bandage dressings to repair the extreme damage, but thankfully, Bailei made a full recovery, albeit with a very unusual pair of legs. In my pursuit to help Kangaroos in my area I have met some people who enjoy the Kangaroos and others who make it their job to make life as difficult as possible for them. I would spend a great deal of time checking fences, patrolling roads near Kangaroo habitat for injured kangaroos and also, just keeping an eye on known kangaroo haters. This is a very dangerous part of my life. I have been abused, blamed, threatened, had my car damaged by a violent individual who was threatening a Kangaroo and countless other frightening incidents, simply because I watch out for Wildlife. Frank, was an elderly gentleman who often noticed me watching the Kangaroos near his property and would often come out to have a chat when I drove past his house. I got to know Frank quite well, we were both concerned about the dwindling Kangaroo numbers in the area. On this occasion there appeared to be a blind kangaroo on a nearby property. I will never forget the conversation we had on that hot November night as we stood mesmerised watching a Mother and Joey interacting together, they clearly loved each other. There was silence for a considerable length of time and then Frank asked if he could tell me about an incident he had never told anyone about before. For some reason he felt compelled to tell me about what had occurred one night when he was about thirty years old. Frank was seventy seven years of age. He went on to tell me how he used to go out Rabbit shooting with his mate when on this particular night his mate decided that they would also shoot a couple of Kangaroos for dog meat. Frank was asked to have a shot at a Kangaroo in the distance and he obliged. He took aim, pulled the trigger and realised it was not a clean shot. Frank wandered over to the Kangaroo who was writhing in pain and trying in vain to push her Joey out of her pouch. 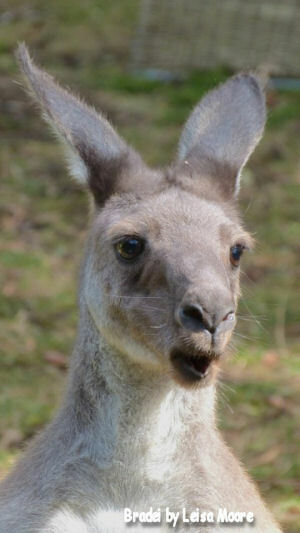 Frank went on to say that he actually heard the Kangaroo scream to her Joey ‘get away, go,the man is going to kill us!’. 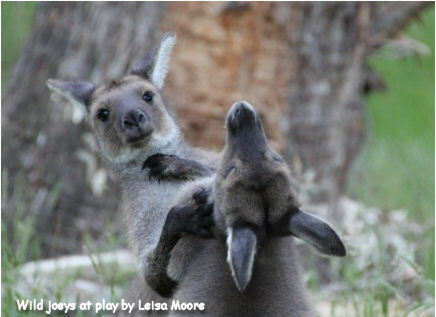 Frank honestly believed that he heard the Kangaroo scream those words to her Joey. Frank, with tears in his eyes, continued with the horrible detail and said that he had to shoot both, Mother and joey. He then told me he was so disgusted by what he did on that sickening night that he went straight home and destroyed his gun and never killed anything again and is now haunted each minute of his life. It was difficult to say anything to Frank when he had finished talking, I am not the forgiving type when it comes to animal cruelty, abuse, neglect, whatever. Frank never came out to talk with me again, so I did not have to deal with the emotions that were challenging my conscience. 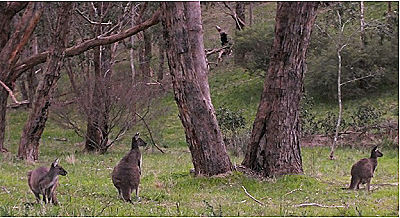 When travelling around I observe and document where and how many Kangaroos are in specific areas. I am not employed by the Government , not a Council Ranger or an R.S.P.CA. Inspector but do all I can on a voluntary basis. This lack of authority has it’s difficulties however, as I am not allowed onto properties to check Kangaroos I may be concerned about. I had been keeping an eye out for several months for an old , what seemed to be, blind, female Kangaroo. The Kangaroo appeared to be coping and was keeping up with her Mob so I felt it was best to monitor her and move her if she seemed to deteriorate at any stage. I tracked her daily and all seemed to be going well for the girl. Then one day, she had disappeared from the Mob. I searched for hours on end and had difficulty in doing so as some property owners would not let me look for her on their land. I would wake up at five am each morning and search for her and return each night at about six pm. till dark. A week later I found her, she was laying exhausted upturned with her legs in the air in a ditch. She was on a property that belonged to a Kangaroo hater, a man who had previously abused me when I stopped to remove a Kangaroo off the road, a man I believe responsible for shooting Kangaroos in the area. I needed his permission to go on his property to retrieve her but feared he would say no. I rang the R.S.P.C.A. but they were unable to come out as it was late at night and the Council Ranger would shoot her for sure. I decided to get her out myself. I went home and got all the equipment required to do the rescue and prepared my car so I could transport her safely. I suspected she had been chased by his dogs so made sure I had the appropriate Antibiotics on hand and Dexamethasone for shock. I returned and placed blankets on her and waited in the car till I felt it was safe to make the move. I approached quietly and she did not move at all, I thought she had died. Then I noticed her beautiful face looking up at me and I could tell she was relieved that someone was there to help. Kangaroos know when they are being helped, they just know. The poor girl was in the middle of a boggy paddock with drainage pipes all over, so it was extremely difficult carrying a fully grown Kangaroo on my own in the dark. I managed to carry her through to the fence where my car was parked and manoevered her through the gate to my car door. I only had a Sedan back then so had to place her on the floor in the front of the passenger seat but being next to me I would be able to place my hand on her and speak softly if she got stressed by the unusual noises during the trip. I carefully lifted her into the car and wrapped her securely then reached into my pocket to get my car keys.... they weren’t there! I race around to the driver’s side door in the hope that I had left them in the ignition, No !!! I had dropped them in the paddock.!! !I had a rough idea where I had picked her up and retraced my steps in complete darkness and... unbelievably, I stumbled across them. I could not believe luck was with me for a change. I ran back to the car and drove home with an exhausted blind Kangaroo next to me. I carried her into the Laundry and she fell straight to sleep, beautiful girl. I woke next morning with her in my arms and her beautiful head tucked into my body. I checked out her injuries and as suspected, she had been attacked by a dog or dogs, presenting injuries consistent with dog attack. She had bite marks and punctures all over her buttocks, legs and neck. I cleaned and dressed her wounds, gave her Antibiotics and Dexamethasone. Sadly, even with Veterinary help, the blind girl died in her sleep a few days later. Tobei was an absolute treasure, a hero in his own right and I believe, along with Lucei, another rescued Joey, saved my life. Tobei was adopted by Lucei who was also hand raised after her Mother was run completely over by a truck. 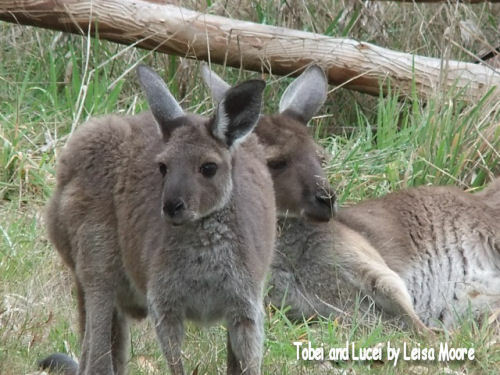 Lucei loved Tobei and they went everywhere together, grazed together, slept next to each other. It was a windy night and after setting up the outdoor heating arrangement I had for the Kangaroos who chose to sleep on the Verandah, and sorting out the food stations, I retired to bed. The heating consisted of galvanised domes which were suspended above the areas where it was dry and comfortable if the Kangaroos felt cold. Near by, there were a couple of containers where Meadow Hay was placed. On this extremely windy night a tragic event occurred and if not for Tobei’s famous Trumpet call he always used to get my attention I would have possibly lost my life and my home. At about 2am I was woken by the repetitive trumpet sound of Tobei, extremely loud and clearly in a state of panic. I stumbled out of bed to see what was going on and to my amazement I saw flames about to catch the eves of the house alight. One of the heaters had blown into the meadow Hay container which in turn caught the cupboard next to the house alight. Tobei and Lucei were standing there side by side, staring at the flames which had nearly taken complete hold. I managed to get the hose to the fire and extinguish the fire. I firmly believe they both knew what they needed to do and did so to save my life. Beautiful Tobei tragically died two years later on my Birthday from a snake bite. I will never forget the bond we had with each other for nearly four years, such a beautiful Kangaroo, his memory etched in my heart forever. Lucei had tears in her eyes the day Tobei left us and for months after... Kangaroos do cry, we never got over his loss. Kangei was a wild Western Grey Kangaroo who often enjoyed visiting my Kangaroos, a dominant male who belonged to the Mob that resides in Council land behind my property. Kangei was about three years of age when he first came to visit, a very trusting and placid Kangaroo. Our bond was sealed the day I found him caught in a neighbour's fence. Kangei allowed me to sedate him and cut him free from the fence. We had only known each other for about a year when the incident happened but he allowed me to inject him on two occasions with long acting Antibiotics and administer Vitamin E daily for Myopathy. Beautiful Kangei would have been about four years old and weighed approximately eighty Kilograms. Realising I was helping him he would like my face and gently stroke my hand with his large soft paw, I was able to dress the wound in his hind leg and thankfully Kangei made a complete recovery. Kangei continued to visit us until March 24th 2010. 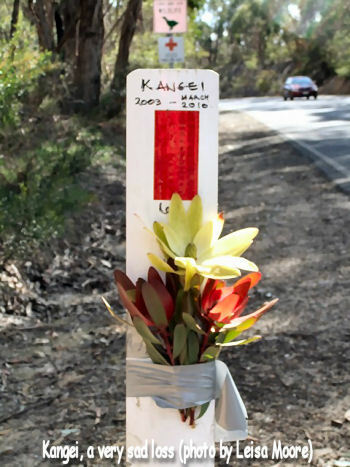 Kangei died after being hit by a car after a dog chased him onto the main road as he was navigating through bushland in a reserve where dogs are legally supposed to be on a lead at all times. 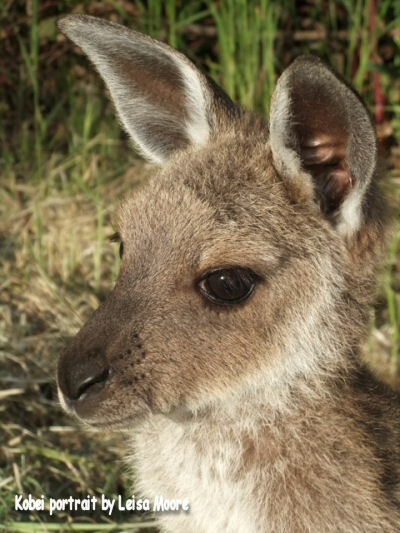 The progeny of Kangei live on with other Joeys that were born after his death. I am aware of two Joeys that are definitely Kangei’s, how precious that I can still be close to him in some way. Kangei is now with his best friend,Tobei. The dynamics of a Mob are extremely interesting to me and I believe many people underestimate the amazing qualities the Kangaroo possesses. On one occasion when I was on a Photography expedition in the bush I spotted the mob in a paddock a small distance from where they usually hung out. I stopped and watched as they were on the move and needed to negotiate a couple of Barbed Wire fences on their return to their day time resting spot. I had noticed the youngest Buck had safely crossed the dirt road along with two of the Does and one of the at foot Joeys. Bradei, the dominant Buck at the time stayed behind to ensure all Kangaroos crossed safely. With him was the other at foot joey who decided it was time to play and rough up Bradei and not follow his Mum. Bradei kept trying to show his Joey where to get under the fence by gently pushing the Joey’s head down to the section where there was a large enough space to get under. The Joey thought Bradei was playing and I had such a laugh watching the antics of the Joey and the frustration Bradei was experiencing. Finally, with a little bit more force by Bradei and a Mother calling her boy, the Joey realised it was time to squeeze under. It was not until the Joey was safely out that Bradei felt ready to to jump the fence and join the Mob. I have seen on many occasions actions which indicate close bonds, love and also grieving of deceased members of a Mob. The bond between a mother and a joey is a special one. 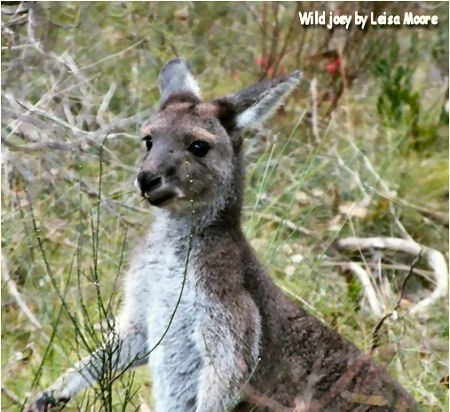 The Joey stays with the Mother for at least eighteen months, the female Joey many months longer and will usually remain with or close to the Mob in her adult life. I have also observed the actions of a Mother to protect her Joey in times when threats are near. Always on the alert, the mother will communicate to her Joey to go to a predetermined spot and hide if she senses a threat. The Mother will then stand completely upright, perfectly still and watch and listen, ears flicking frantically in all directions like a radar. If she feels it necessary she will leave the scene to take the threat away from her Joey. The Joey instinctively realises it must not follow, it understands it must remain still and completely quiet and wait for its Mother to return when she feels it is safe to do so. I have observed a Joey wait more than three hours for her Mother to return. The love and excitement shown when they reunite is so precious, wow, I love them. I have also experienced the love the Kangaroos in my care have for me. I have never had a sick day whilst being a Wildlife carer. Fact is, I can’t. Too much Kangaroo work to be done. When I experience unrelenting pain I sometimes have to lay down for a while, but I am never alone. The Kangaroos sense when I am unwell and will always join me either on my bed or on the floor next to the bed. Sometimes I am lucky to get any of the bed but feel so happy when they are with me. They are my healers. The Kangaroos have a choice to do as they wish, they can come inside or they may choose to graze and lay around outside. I love it when I am their choice. As mentioned at the beginning of my story, my journey spans from Gooby to Kobei. Kobei came into my life on August 31st 2010 at the age of five months. He was orphaned after his Mother lost him from her pouch when being chased by a dog on someone’s property. The owners of the property left the little Joey, whom I named ‘Kobei’, after Kangei and Tobei, near a bush all night in 3 degrees C. amongst predators such as Foxes, in case the Mother returned for him. Unbelievably, Kobei survived the night but his Mother did not return. How such a small Joey could survive those conditions astounds me till this day. Kobei apparently stayed in the same place all night. He did not move a centimeter. They picked him up and I was contacted and asked what they should do with him. Kobei became part of my Mob and has been with my other Kangaroos ever since. Kangaroos are very accepting of new arrivals and I gradually introduced him into my Mob. He has grown up to be a vibrant and content Kangaroo who loves Lucei and his other Mob friends that live here. I would much prefer that the Kangaroos who have had a second chance of life with me never had to experience losing their Mother but I suppose they are the luckier ones in a Country that insists on slaughtering millions of Kangaroos and Joeys each year. Kangaroos are blamed for just about everything and have been betrayed since white man set foot on their land. It’s little wonder that when they are observed they are always on the lookout for Human threat, introduced predators along with the ongoing loss of habitat due to degradation of land and urban sprawl. Where I live I have noticed the number of Kangaroos drop 75% in twenty years and there is no Kangaroo Industry here to blame, only human intervention, greed and a blatant disregard for Wildlife. I have seen and still see people buy properties knowing it is home to Wildlife and feel it is their right to apply for destruction permits to get rid of the animals. Sadly, I don’t think there will be many Kangaroos in my area in the near future and only then will the Kangaroo haters be happy. Life as a Wildlife carer has given me a rare insight into the world of the beautiful Kangaroo. I have witnessed first hand the threats they continually face and will continue to face in a world so entrenched with a greed mentality. As urban sprawl spreads like an out of control Cancer, the demise of the Kangaroo, I believe, is imminent. They won’t make a noise, they won’t fight back, the Kangaroo will just disappear. History will, unfortunately, repeat itself. Australia is an expert at achieving Wildlife extinctions. My Wildlife journey, so far, has been like a Roller Coaster, I have been pushed to say and do things I never thought I would or could. I will continue to support Kangaroos for as long as I live.... they are my life long passion. My biggest wish is for the Kangaroo to be appreciated and respected before it is too late, so that the amazing people who relentlessly endeavor to give a voice to these precious, sentient beings can continue to admire, observe, photograph, love and appreciate their wonder. Contempt for kangaroos as an indestructible "pest"
I just read a very inspiring photographic book called "Kangaroos" by Steve Parish. His writing was very empathetic for the roos, and the many challenges they are facing. The photos were superb. However, at the end he supported the kangaroo meat industry! He said they can grow to "plague" proportions and must be "culled". He obviously is a grazier or a big meat eater, and his perspective has been warped by Western values. 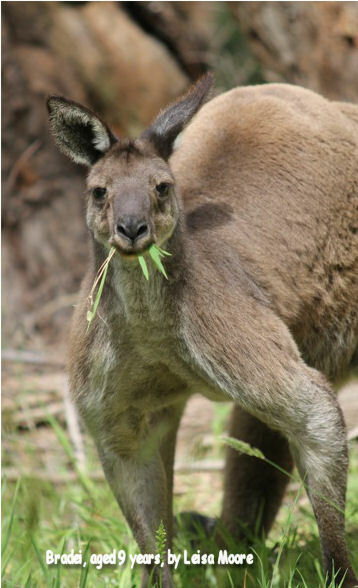 Already the challenges to our kangaroos are almost consuming, and some are already extinct. Six macropod species have become extinct in the past 200 years and a number of species are threatened or endangered. It's assumed the ones that have survived are indestructible, will never be extinct and breed in exponential proportions! The Murray Darling Report (2004) is a scientific report published by the Murray Darling Commission and written by government and independent scientists. It makes clear warnings regarding the risks of hunting kangaroos below 5 kangaroos sq/km (‘quasi extinction’). The NSW Scientific Committee is examining a submission that challenges the science behind kangaroo census data. The most recent studies for the Office of Environment and Heritage put roo numbers in NSW at a fairly healthy 11 million, based on regular aerial surveys. Ray Mjadwesch, spent years comparing kangaroo population data, gathered at a national level for commercial harvesting of the animals, with the situation on the ground. His findings, which have the support of some animal welfare groups, suggest critical declines in roo numbers are not being picked up by aerial surveys. What other native and endemic animal to Australia has ever been so vilified and misunderstood with such ongoing Colonial-attitude contempt? Today I witnessed the aftermath of deliberate cruelty. I was called out to two injured adult roos and a Joey. It was in fact three adults and an at foot Joey that had been mowed down and left to die. All three adults and Joey had to be euthanised by the police. When I got there two adult females had been euthanised but the Joey was still alive with blood seeping through the ear, lying on his side unable to move. Soon after we discovered another adult female on her side unable to get up and clearly in a lot of pain. All four were in the tyre tracks of a car that had deliberately left the road to run them down. What upset me most is knowing no one is going to be held accountable for this abhorrent cruelty. The disassociation by the general public about the pain and grief native animals suffer sickens me. Can you imagine if it were someone's pets lying by the side of the road still alive? The whole street and the emergency services there would be there with demands to catch the perpetrators. I managed to get a photographer from the local paper, the police and the council to come out to the scene of carnage of a 100 metre stretch of a quiet suburban, residential road. But why an earth were the residents who live on that road more eager to get to work on time than help these poor innocent kangaroos? Sorry to off load with yet another case of cruelty. When I talk about this to non wildlife carers I get the look of 'it isn't a big deal'. But it is a big deal and until these sickos are hunted down and made to pay, nothing is going to change. Just a slap on the wrist with a wet lettuce leaf.